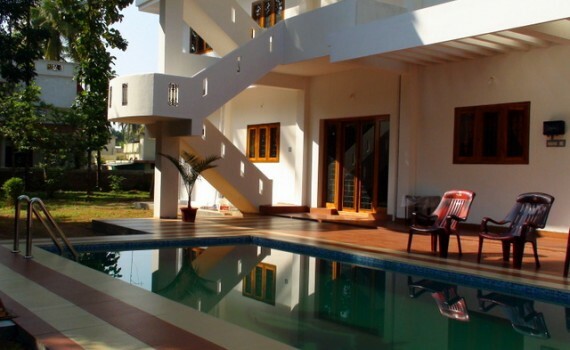 When you talk about Thrissur Homestay, AestheticHoliday is the first choice. AestheticHoliday is a serviced villa with all modern amenities, and it is not just a homestay. It is ideally suited for small groups of about 10 to 20 people. The ambience is ideal for small parties and we have a swimming pool in the courtyard. AestheticHoliday is situated in a 4-acre nutmeg orchard. There are 3 AC bedrooms and 2 Non-AC rooms. The majority of our clients are groups attending weddings in Thrissur or NRI families visiting their relatives in Thrissur. If you are looking for a homestay in Thrissur, do contact us. Thrissur is situated in the centre of the state of Kerala and is also known as the Cultural Capital of Kerala because of its cultural, spiritual and religious leanings throughout history. The district hosts the Thrissur Pooram carnival, the most colourful and magnificent temple festival in Kerala. The festival is held at the Thekkinkadu grounds in April or May. Thrissur has a large number of well-known temples including the Vadakkumnathan temple, Thiruvambadi Sri Krishna Temple and Paramekkavu temple, and the Guruvayur temple as well as two famous churches, the Our Lady of Lourdes Syro-Malabar Catholic Metropolitan Cathedral and the Our Lady of Dolours Syro-Malabar Catholic Basilica. Thrissur homestay is located in this exotic location. Thanks for visiting our site. Please check out our some of our farm products too. We also have a well equipped Gym and our tariff is available here.